Round challahs are most traditionally used for the Jewish New Year, Rosh Hashanah. At the beginning of our new year, to usher in a sweet and delectable judgment, many people have the custom to serve sweetened foods, and challah is no exception to this rule. 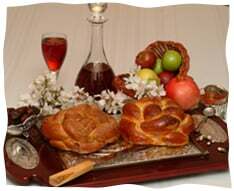 For this reason, Rosh Hashanah challahs are often sweeter than those served the rest of the year. Some add more sugar than they normally do to the dough, others add raisins to the dough, still others do both. I enjoy adding all this to my challahs, but with another twist too; after they are egg-washed and ready to be baked, I sprinkle each with a mixture of cinnamon and sugar. The smell they emit while baking is absolutely heavenly, and the taste is out of this world. Truly a holiday treat! To begin with the shaping of these special challahs, make the strands by rolling out each ball of dough with rolling pin. Roll up into logs towards you and set aside for 10 minutes on your work table, under a plastic disposable tablecloth so they won't dry out. They will have risen somewhat. Take your risen dough strands and roll them out gently as long as possible. Do this with four pieces of dough until they are all about the same length. Lay the pieces out in front of you, tic-tac-toe style. If you intend to add raisins to your Rosh Hashanah challahs, place them all around the flat piece of rolled out dough and then roll it up. When you go to shape the dough, the raisins will all be well hidden inside and will be delicious when the challah is sliced open. Each strand should be placed in opposite directions; one side is over/under, the next row is then under/over. There should now be 2 sets of 2 strands each coming out from the four sides of the woven middle, one under and one over in each set. From each set, pick up the one that was "under" and pull it over its partner, thereby placing each of these "unders" over their corresponding partner, in a clockwise rotation. Practically speaking, this means that the left piece of each set will be placed over the right piece of each set. When this rotation is done, work in the opposite direction, clockwise. What was formerly the right piece, will now go over the left piece in the counter clockwise direction; the pieces are not yet next to each other as they are still apart from the first rotation; pull them close to each other and bring the right piece, i.e. the one you did not touch in the first rotation, over the left piece of the neighboring strand. After this second rotation is done, do a third one, now going back in the other direction. Do one more opposite rotation if you have enough dough left. To finish, pinch each set of two ends together firmly, then bring all four sets together towards the center. Now comes the really fun part: carefully flip over your challah and look! You now have a beautiful, woven, round challah. Leave to rise on a large baking tray that has been lined with parchment baking paper. Cover the challahs loosely with disposable plastic tablecloths while rising. After 20 minutes of rising, turn on your oven to preheat at 400 F/200 C, as most ovens take 20 minutes to reach full temperature. After the full 40 minutes of rising time, glaze your challahs with egg glaze and place them directly into the hot oven, for optimum baking results. Bake for 35-40 minutes until the top and bottom are golden. Another way to make nice, round, braided challahs is by taking three long strands and braiding them into a very long Havdalah-candle-shaped log. After this has been braided, carefully tie it up as if you are making one large knot out of it, and leave it to rise. It will come out different than a simple round knot, and although not quite as extravagant as the woven round challah, it is still quite pretty. Tamar Ansh is a recipe developer and food columnist, and runs a designer cake business. With more than 15 years of creative baking and cooking experience, her food articles have appeared in major publications worldwide, and she is the author of three other books as well. She lives with her family in Israel. Reprinted with permission from A Taste of Challah by Tamar Ansh. Absolutely Welcomed! This is my first year in the observant community, and loving it! yesterday one of my working lady friends asked me if I'd come over and help her cook and bake for the holidays - ofcourse! so I used this 'double 4' strands' braid - which I've been using for years, thinking that I had nothing new to offer the already observant women... wrong! she and her husband loved it! they've never seen a round and braided challah! I made them 8! so now I've been asked to do more for others... I'm delighted! and feel included.